UPDATE 1900 GMT: White Helmets civil defense in East Ghouta say at least 33 civilians have been killed today by pro-Assad airstrikes and shelling. “We had hoped the bombing would stop for even a few hours—but the planes never left the skies,” East Ghouta Civil Defense spokesman Siraj Mahmoud told Syria Direct. UPDATE 1500 GMT: Russian President Vladimir Putin has ordered his forces to observe a humanitarian pause in operations in East Ghouta from 9:00 a.m. to 2:00 p.m. local time, starting Tuesday. Russian Defense Minister Sergei Shoigu said a humanitarian corridor will be opened for civilians to evacuate the area. The tactic is similar to used by Russia during the five-month siege and bombardment of eastern Aleppo city until the opposition capitulated in December 2016. Kremlin spokesman Dmitry Peskov said Putin had discussed the situation in East Ghouta with the National Security Council. Maintaining Moscow’s attempt to justify pro-Assad attacks, Peskov added that the Security Council expressed concern about the “provocative actions” of the Syrian opposition. Meanwhile, Russian Foreign Minister Sergei Lavrov tried to give further cover for the Assad regime’s alleged chlorine attack on Sunday, declaring that “disinformation” about the assault could sabotage ceasefire agreements. UPDATE 1415 GMT: Turkey has indicated that it will also not observe any ceasefire, in this case concerning its offensive against the Kurdish militia YPG in northwest Syria. Deputy Prime Minister Bekir Bozdağ said the Turkish Armed Forces will soon launch a “new phase” in their advance on the Kurdish canton of Afrin with the deployment of Gendarmerie Special Operations personnel to carry out urban warfare. “The deployment of the special forces is a sign of preparations for the new struggle looming ahead,” said Bozdağ, pointing to movement from current attacks on villages to fighting for Afrin city. The Turkish military says it has taken about 500 square km and is now preparing to besiege Afrin city, with more than 100,000 civilians. Reports on Monday indicated that the Turkish military has now secured control all along the border with northwest Syria, 250 kilometres (165 miles) from the Atmah area in Idlib Province east to the Jarablus area on the western bank of the Euphrates River. Turkish forces and Syrian rebel allies hold about 20% of Afrin canton, but still have not taken towns such as Rajo and Jinderes in their six-week offensive. UPDATE 1230 GMT: The Kremlin has reasserted the pretext for pro-Assad attacks on East Ghouta by invoking “terrorism”. The Kremlin said Putin “emphasized that the ceasefire did not extend to military operations against terrorist groupings in Syria”. Russian State outlet RT bolsters the pretext with the headline, “Syrian Ceasefire Problematic Because of Sponsors Fueling Violence”. Good morning to all،But the usual morning death to us inside the Gouta,All the love for all the people who are trying to get help for people inside the gouta,i try to get help for people here from everywhere,but i can not. Just want to pray and send assistance immediately to us. Pro-Assad attacks are continuing, with more civilian casualties. In Douma, six residents were reportedly killed and others wounded by rockets. Others were said to have perished in early-morning bombing. ORIGINAL ENTRY: Defying a UN call for a ceasefire in East Ghouta near Syria’s capital Damascus, pro-Assad forces continued their assault threatening more than 350,000 people on Sunday. Supported by Iran and possibly Russia, Assad regime warplanes carried out strikes near Douma and shelled across the territory. Pro-Assad forces launched a ground offensive against the town of Harasta, northeast of the capital. 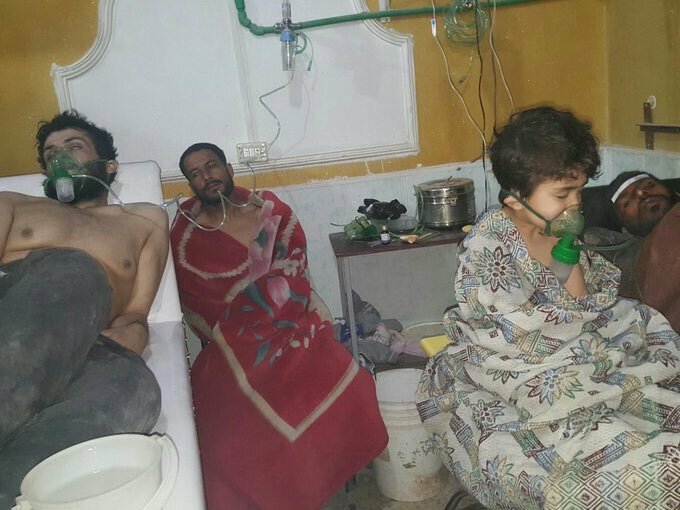 Reports said the regime even returned to the use of chlorine gas — with a child killed, an infant on a ventilator, and at least 16 other people injured — on the eastern side of the pro-opposition pocket. To cover the Assad regime’s use of chlorine, the Russian “Center for Reconciliation” in Syria put out the headline on Sunday, “Militants in Eastern Ghouta Prepare Provocation Involving Chemical Weapons”. Iranian State media promoted Russia’s false claim. Video posted by a pro-Assad activist confirms the rebel account, showing the bodies of pro-Assad forces in a trench. On Saturday, the UN Security Council voted unanimously for a 30-day ceasefire to allow assistance to reach East Ghouta, where a five-year siege has been tightened since early 2017. But to get Russian acceptance, Council members removed a 72-hour timetable for implementation, giving space for the Assad regime to maintain its recent escalation of attacks. Since February 18, the assault has killed more than 500 people, including more than 100 children, and wounded hundreds. In a pointed rejection of the ceasefire call, Iran said that, alongside the Assad regime, it will continue the attacks. Parts of the suburbs of Damascus, which are held by the terrorists, are not covered by the ceasefire and clean-up [through military operations] will continue there…. This time again, like in the past, those who do not want security and peace in Syria took up the banner of ceasefire in order to support terrorists after they saw the Syrian army and government were cleansing the Damascus suburbs. French and German leaders Emmanuel Macron and Angela Merkel each spoke by phone with Russian President Vladmir Putin, hoping to persuade Moscow to put pressure on the Assad regime and the Iranians. But Russian officials, include Foreign Minister Sergey Lavrov, have set up the pretext for ongoing attacks with the false claim that they are against the hardline Islamist faction Jabhat al-Nusra, formerly linked to Al Qa’eda and now part of the Islamist bloc Hay’at Tahrir al-Sham. In fact, there are few HTS fighters in East Ghouta, where the leading rebel groups are Jaish al-Islam and Failaq al-Rahman. #Russia-backed Tiger Forces media guy purportedly on #Nashabiyah frontline today. After the deal, new weapons have been used that were not used before. We are talking now about a green light for the Syrian regime and his Russian allies to destroy this society before the eyes of everyone. I cannot say anything except damn the whole world, and damn everything.